The two photos were both taken in the same place at 12:15 p.m. EST one day apart. The difference is yuge. And, yes, both images feature the infamous white plastic White House Press Secretary Sean Spicer claimed makes crowds look smaller. Vox is reporting the Women's March on Washington was about twice as big as Trump's inauguration, with a crowd of around 500,000 attending the Women's March. 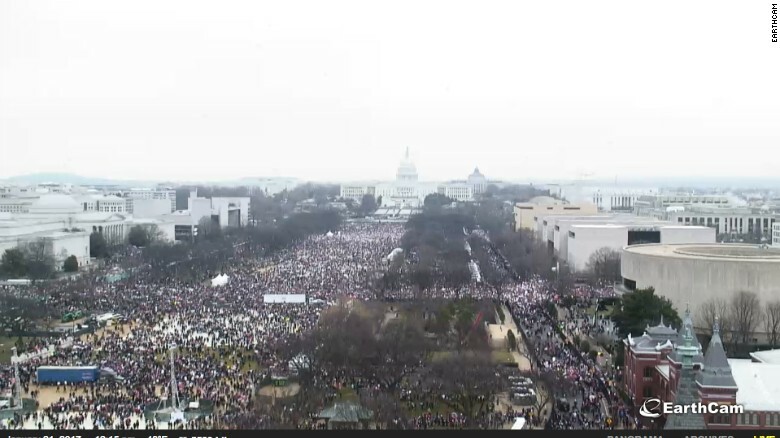 Meanwhile The New York Times—which has a lower estimate of Trump's crowd size—believes the Washington Women’s March was actually three times larger than the inauguration. USA Today is reporting that in total Women's Marches around the world had a turn out of around 2.6 million people at 673 marches in all 50 states and 32 countries. On The View’s Monday episode, Women’s March co-founder Tamika Mallory refused to condemn anti-semitic comments made by Nation of Islam leader Louis Farrakhan.